This is another submission that's a bit older. Tex Fischer sent this concept it a while back, but it could make a nice alternate uniform for the Sabres. Thoughts? How's this for a Winnipeg Jets third jersey? You know it's coming one of these years. Why not go with this look by Tex Fischer? We're riding out 2013 with the Canucks today as part of Tampa/Vancouver Week. The Lightning are in Vancouver tomorrow — one of only two games taking place in the NHL. (Any guesses what the other one is?) The theme today, as you may have guessed, is the Canuck's retro stick-in-the-rink logo. It's featured on every design today, including this one from Bastian Schmülling. I particularly like the green option. Tex Fischer brings us a more subdued set. But I think that crest can make any sweater stand out. Finally, Brendan Anderson envisions a minor tweak to the Canucks' existing third before making a home and road set out of it. 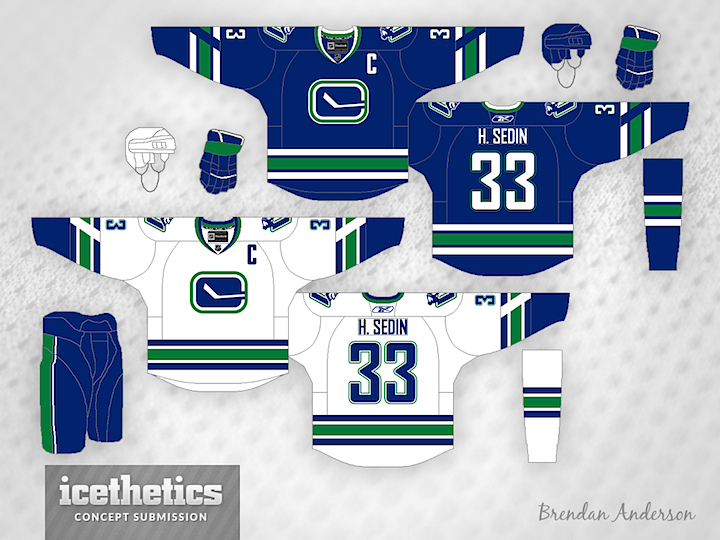 All three designs have unique aspects and prove that this could be a great, timeless look for Vancouver. Here's an odd Classic Saturday idea to throw out there. 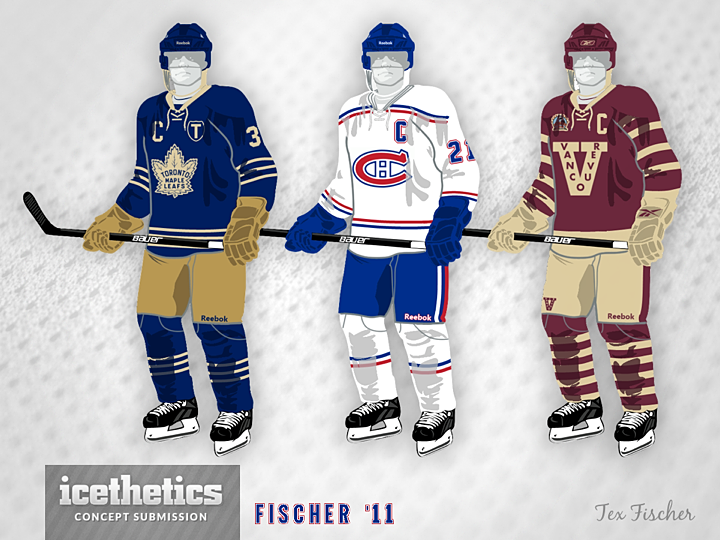 Tex Fischer put together these Heritage Classic-type throwback designs for a trio of Canadian teams a couple years ago. They've been sitting in my inbox for a while. But I suddenly had a thought. With all the extra outdoor games we're getting next winter, the concept is bound to lose some of its novelty. Is that idea totally crazy? I think it would make for a very cool event over a long holiday weekend. And it would make the Heritage Classic unique again. Not only that, but from a marketing perspective, you get another huge fan base in the mix. 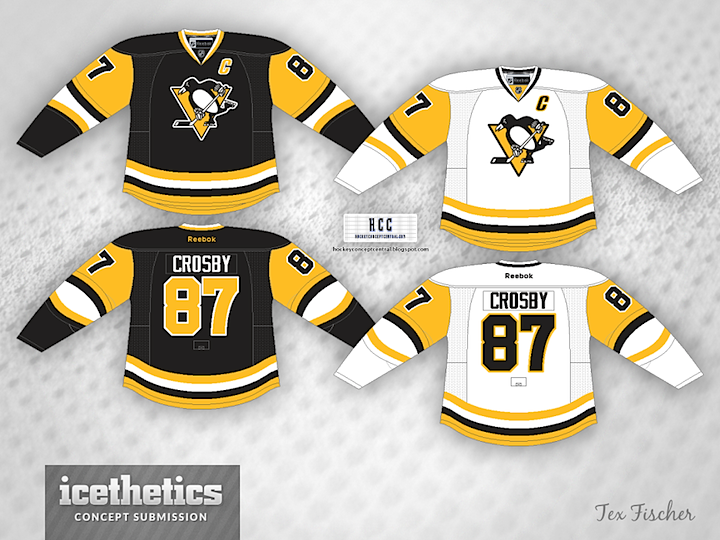 Why aren't the Penguins already wearing these? Tex Fischer has done a great job adapting those classic late '80s sweaters to Reebok's beloved Edge design. Let's see them on the ice already.